Whatever your need in a sensible, confident, flexible and highly fuel-efficient vehicle, your local Toyota dealer has you covered with a selection of high-utility hybrid models that gracefully combine space, versatility, and exceptional fuel economy. At the core of all Toyota hybrid models is the proven Hybrid Synergy Drive system, which combines a conventional gasoline engine with an electric motor drive system and a high-powered battery. Using self-generated electricity, Toyota hybrid models use their electric motor drive system to assist, or even replace, the use of gasoline in certain situations—reducing fuel consumption and emissions in the process. No other automaker has experienced the success and sales volume achieved by Toyota when it comes to hybrid vehicles. That’s largely thanks to the brand’s reputation for building reliable, effective and affordable hybrid models targeted towards the motoring masses. Today, an all-new hybrid model has joined Toyota’s lineup. 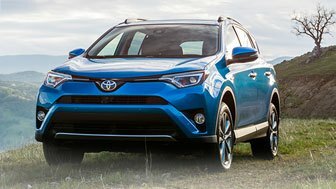 The 2016 Toyota RAV4 Hybrid is the brand’s seventh hybrid model, and one that promises shoppers a compelling blend of hybrid technology alongside core RAV4 attributes, including an upscale cabin, tremendously flexible interior, sophisticated styling and adventure-ready capability. The new RAV4 Hybrid marks the first time the RAV4 has offered a hybrid powertrain, which joins the model’s standard four-cylinder gasoline engine lineup. 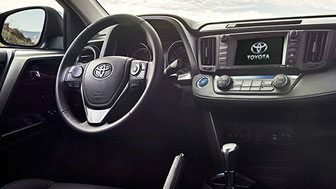 The all-new RAV4 Hybrid is powered by a unique version of the Toyota Hybrid Synergy Drive system that has been specially optimized for use in the RAV4. At the core of the powertrain is a 2.5-litre four-cylinder engine, running the Atkinson cycle to achieve the ultimate in gasoline combustion efficiency. High-torque electric motors and a continually variable transmission are teamed up with the gas engine, and drivers can expect best-in-class city and combined fuel efficiency figures of of 6.9 and 7.2 litres per 100 kilometres, respectively. That’s small-car fuel economy in a fully capable crossover. Ensuring that there’s a Toyota RAV4 Hybrid appropriate for any shopper or budget, the model is offered in two trim levels, and with an available Technology Package, and a full range of approved accessories. Available feature content includes automatic dual-zone climate control, navigation, a JBL audio system, push-button ignition, hazard-detection safety technology, parking assist monitors, power seats, and more. The generously loaded RAV4 Hybrid XLE starts at $34,715, while the top-line RAV4 Hybrid Limited opens the bidding at $38,515. The RAV4 Hybrid Limited packs an extensive list of feature content, and serves as a rolling showcase of the latest in Toyota high-tech. Best of all, a full model-range styling update applied to the 2016 RAV4 means that all models benefit from a new look that’s sleeker, more sophisticated and more upscale — inside and out. Finally, note that the RAV4 Hybrid boasts a significant power output increase over the standard model, despite its improved fuel efficiency and capability of zero-emissions driving in certain situations. Find out more about the All New 2016 Toyota RAV4 Hybrid on the Milton Toyota website.